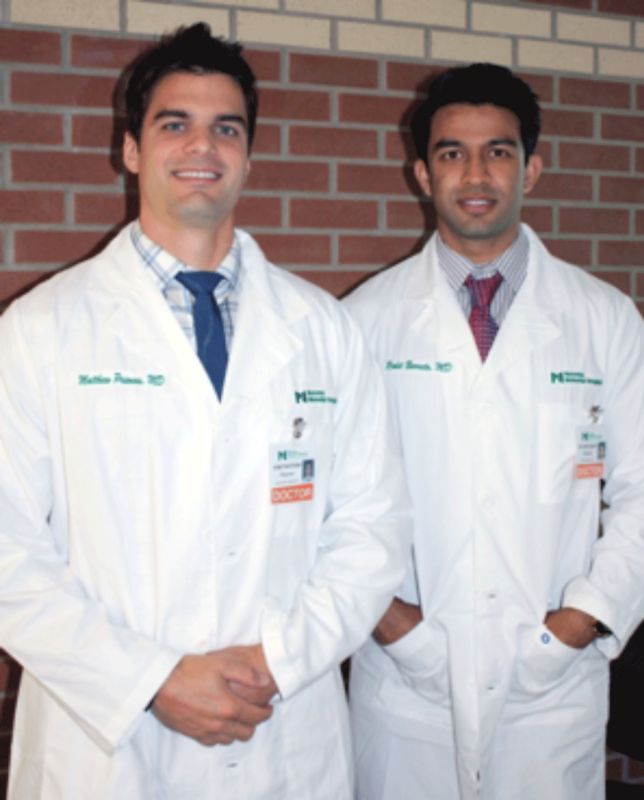 Doctors Matthew Prionas and Rohit Barreto. Photo submitted by Chelsea Donovan, Massena Memorial Hospital. MASSENA -- Massena Memorial Hospital has started the Center for Lifestyle and Weight Management Program which provides an array of services to help you achieve specific health goals. This program will be offered in two parts. The first part is working one-on-one with a board-certified obesity/weight management physician; the second is joining an eight-week educational program with the Nutrition Services Department. The program begins Feb. 13, 2019. Patients will have an initial visit with Rohit Barreto, MD, or Matthew Prionas, MD, of the MMH Medical Group at 181 Maple St. Patients should call to schedule an appointment with one of the physicians. A weight management specialist will conduct a comprehensive initial assessment and medical evaluation of the medical, biological, emotional and psychosocial issues that affect your weight. Based upon this in-depth assessment, an individualized weight management treatment plan will be developed (and mutually agreed upon) with the options of focusing on an array of treatments, including diet, physical activity, behavior change, psychological counseling, and medications. During your initial appointment you will meet with one of the physicians who specialize in Weight Management. Subsequent appointments will be based on your individual needs, but the goal of these appointments is for Dr. Barreto or Dr. Prionas to monitor patients’ progress and continually assist them in meeting their end goals. Costs for individual consultations depend on the specialist you see and the number of visits. Some services may not be covered by insurance. Contact your insurance company if you have any questions regarding coverage. The team provides care for many medical conditions, including: weight management, nutrition, fitness, and health psychology. The physicians offer a comprehensive array of diagnostic and therapeutic procedures and consultation including: behavioral counseling, dietary counseling, disease management, exercise counseling, pharmacotherapy and psychological counseling. Registered Dietitians Mary Mittiga and Beth Morgan’s Weight Management & Healthy Lifestyle 8 Week Series will began a few weeks later. All patients are encouraged to participate in this eight-week education program; however, these educational/support sessions are free and open to everyone to have a more profound impact on the community. These classes be held every Wednesday evening from 5-6 p.m. beginning Feb. 27. Some topics that will be covered during these classes include basic nutrition and portion regulation, healthy eating when dining out, and fitness. There will also be food sampling, recipe exchanges, and guest lectures. If there is anyone who does not want to attend this program but wishes to schedule an appointment with our registered dietitians, Mary and Beth will offer one-on-one sessions to patients with a physician referral. Patients who could use some support through their weight loss or weight management journey can see Allison Herne, licensed clinical social worker. To sign up for the free educational support program, call MMH Public Relations at 315-769-4262.